As you can make out from the name itself, this milkshake is simply out of this world!! 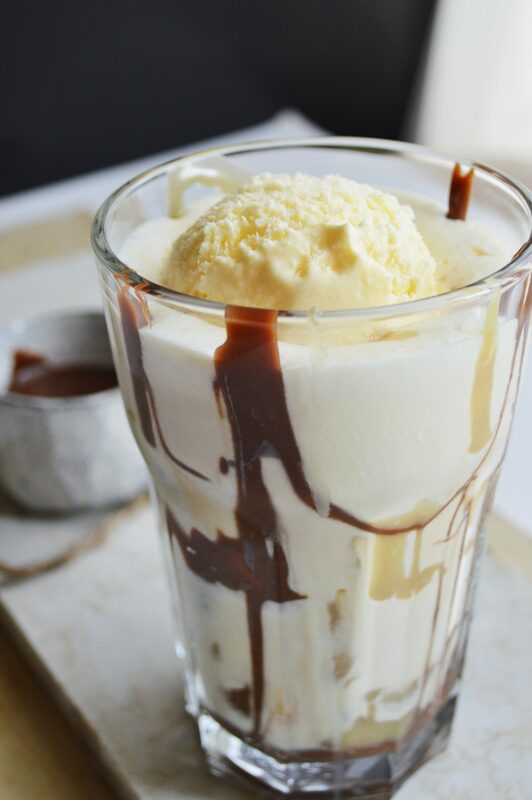 The base of the milkshake is vanilla ice-cream blended with this super easy homemade butterscotch sauce, a little splash of milk, vanilla extract AND the best part, chocolate peanut butter hot fudge smeared all around the glass which tastes like melted snickers chocolate. Whoa! Soo good! Honestly if you wanna stop it right there, you could. 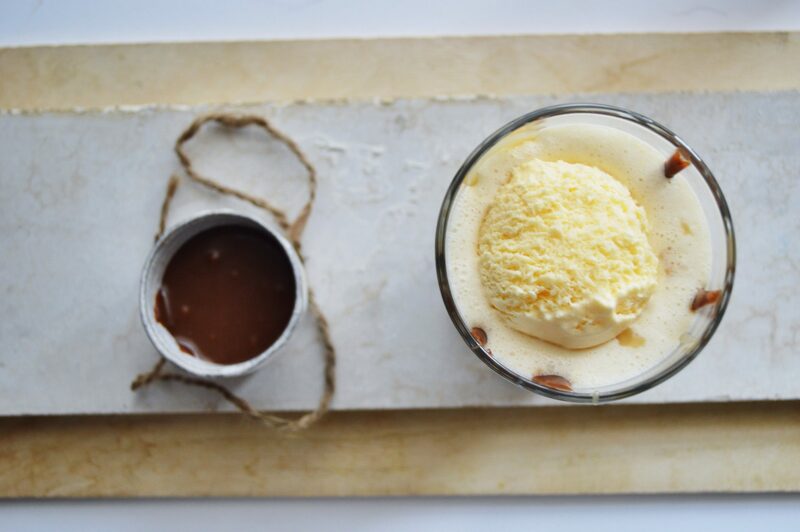 But if you desire, you can add a scoop of ice-cream on top just before serving to make it all the more luxurious and yummy and this definitely will leave the kids clamoring for more.! Why would you wanna skip on this?! 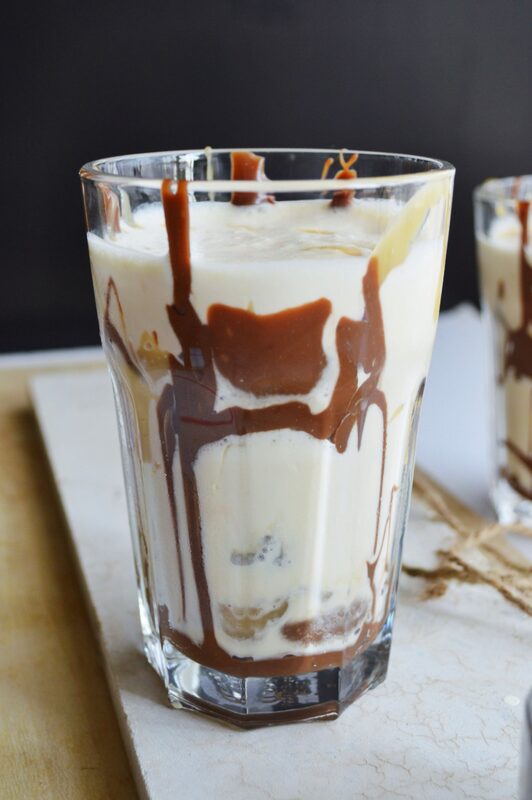 As tasty as the combination of butterscotch, ice-cream , chocolate fudge and milk, its actually a little tough to justify the calories, so sip away in moderation, for this is more of a rich dessert drink and not recommended for regular sipping. Me and my husband usually love to skip a meal and enjoy drinking a glass of deliciousness…something like this rich, creamy milkshake. This kind of drink being soo filling will keep you satisfied until next meal. Now, don’t you want a sip? You’ll not be disappointed! Try it for sure. 1. 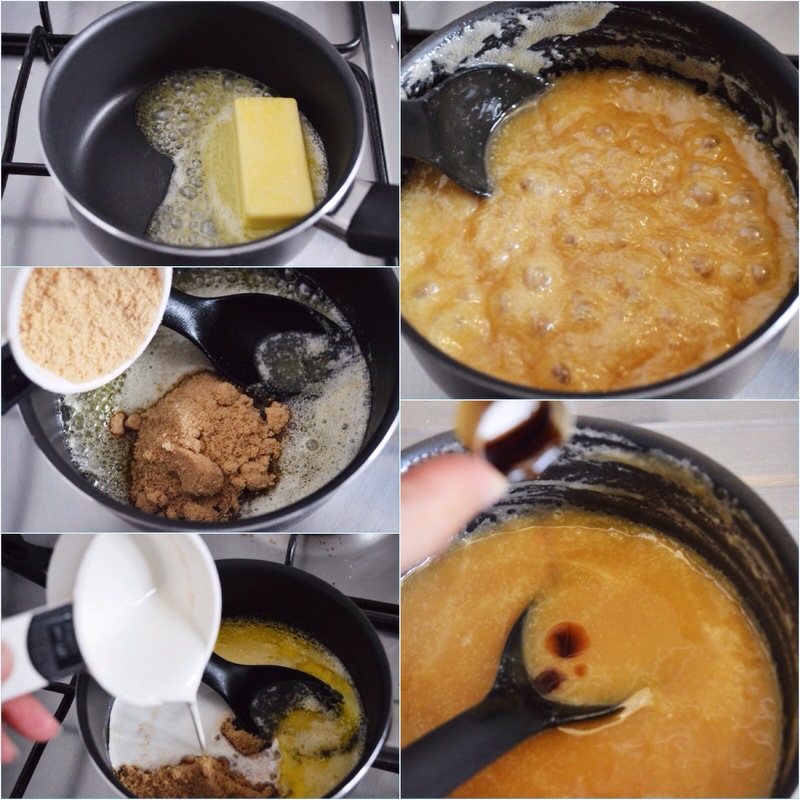 Make the butterscotch sauce. Melt the butter in a small sauce pot. Add the brown sugar, heavy cream and salt. Bring to a boil and then reduce heat to medium. Boil for 2-3 minutes. Remove from heat and stir in the vanilla. 2. Place 2 tall glasses in the freezer. 3. Take the blender jar and add 1/3 cup of the butterscotch sauce (let the rest sit on the counter for later), 1/2 cup of milk (start with less if you like really thick milkshakes), 1 teaspoon vanilla. Place the blender jar in the freezer. Then scoop out 3 cups of the vanilla ice cream and place it in another bowl. Place the ice cream back in the freezer. Freeze both the ice cream and the ingredients in the blender jar for at least 20 to 30 minutes. 4. While the ice cream freezes make the peanut butter fudge sauce. 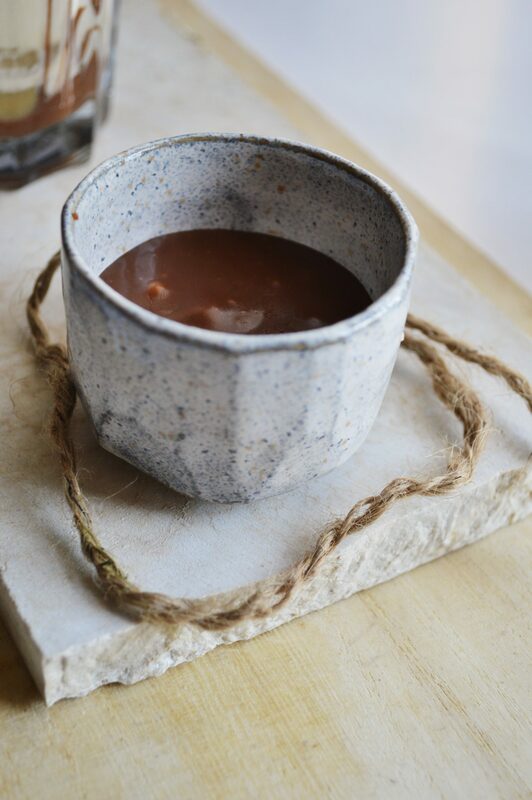 In a microwave safe bowl add the butter, sweetened condensed milk, peanut butter and chocolate chips. Microwave for 30 seconds, stir and microwave another 30 seconds, stir and if needed microwave another 30 seconds. Once everything is melted and combined together stir in the vanilla. Set aside. 5. 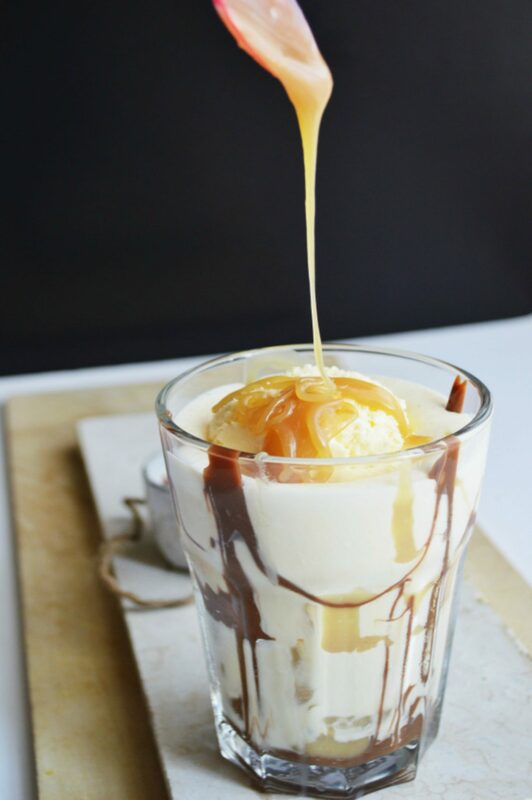 When ready to serve, remove the two glass from the freezer and add the warm hot fudge sauce to the bottom of each glass, then add a drizzle of the butterscotch sauce. Drizzle the chocolate sauce all over the glass very well. 6. Remove the ice cream and the blender jar from the freezer. 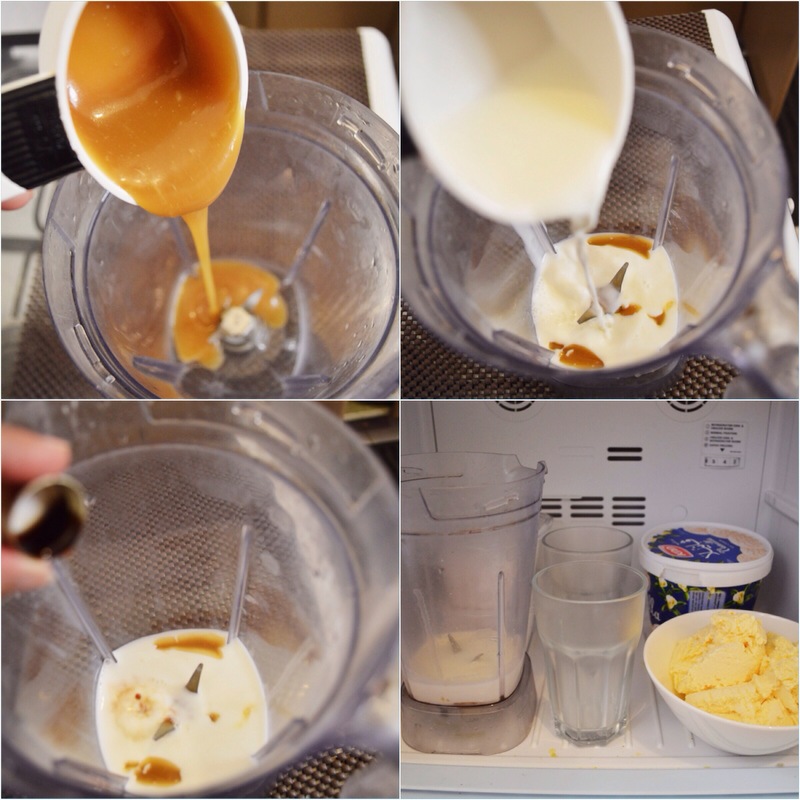 Add the ice cubes and half of the ice cream to the blender and blend on high until smooth. Add the remaining ice cream and blend until chunky or smooth (your call), i just pulsed mine 2-3 times. 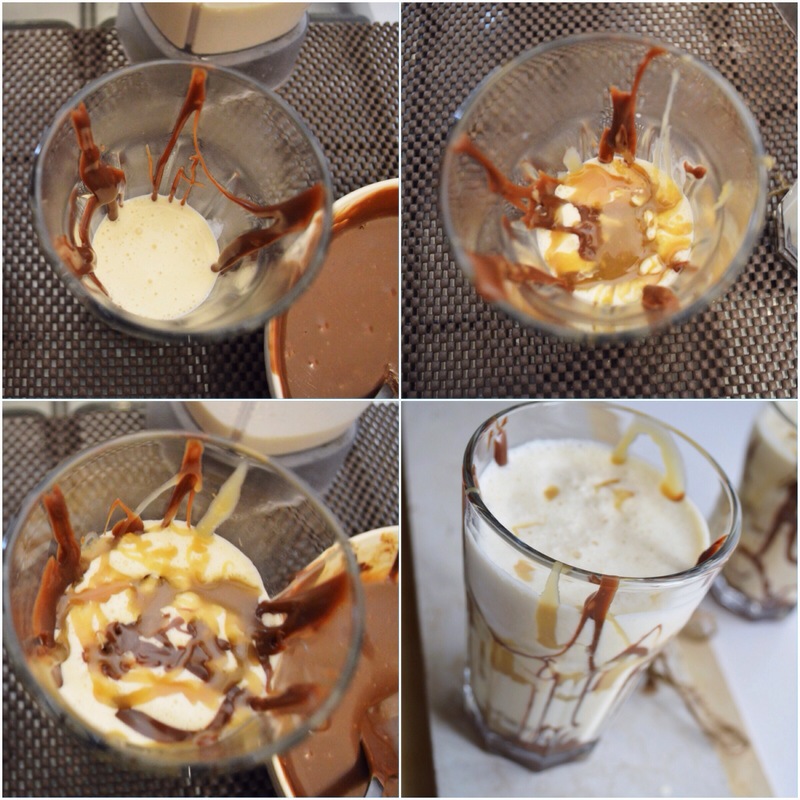 Layer the milkshake in the glasses with the nuts, butterscotch sauce and the peanut butter fudge sauce. Serve immediately. 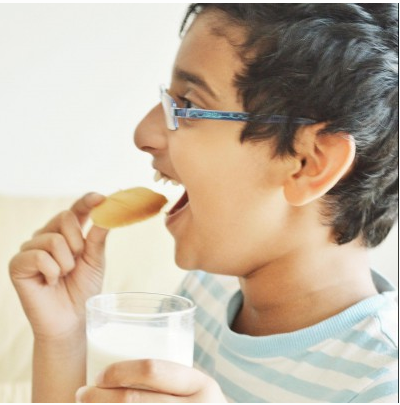 ✔️ This milkshake is a bit too heavy on the stomach, so if you are serving this to your kids it would be better if you use smaller glasses for serving. 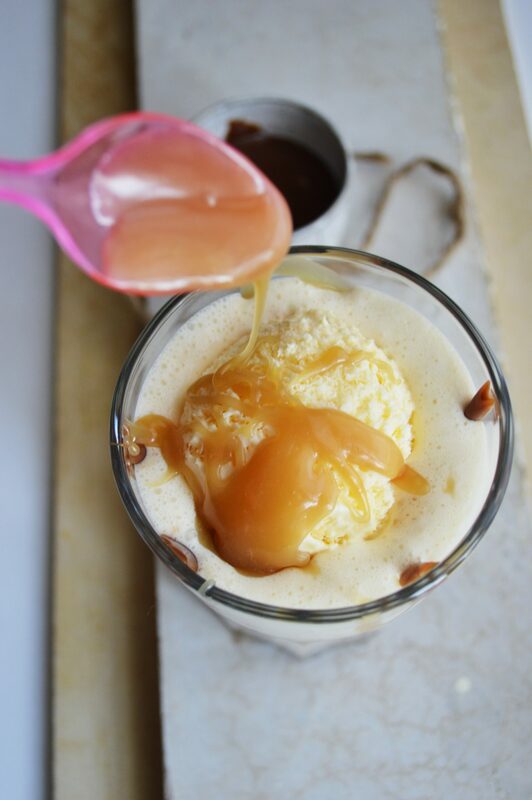 Make the butterscotch sauce. Melt the butter in a small sauce pot. Add the brown sugar, heavy cream and salt. Bring to a boil and then reduce heat to medium. Boil for 2-3 minutes. Remove from heat and stir in the vanilla. Place 2 tall glasses in the freezer. Take the blender jar and add 1/3 cup of the butterscotch sauce (let the rest sit on the counter for later), 1/2 cup of milk (start with less if you like really thick milkshakes), 1 teaspoon vanilla. Place the blender jar in the freezer. Then scoop out 3 cups of the vanilla ice cream and place it in another bowl. Place the ice cream back in the freezer. Freeze both the ice cream and the ingredients in the blender jar for at least 20 to 30 minutes. While the ice cream freezes make the peanut butter fudge sauce. 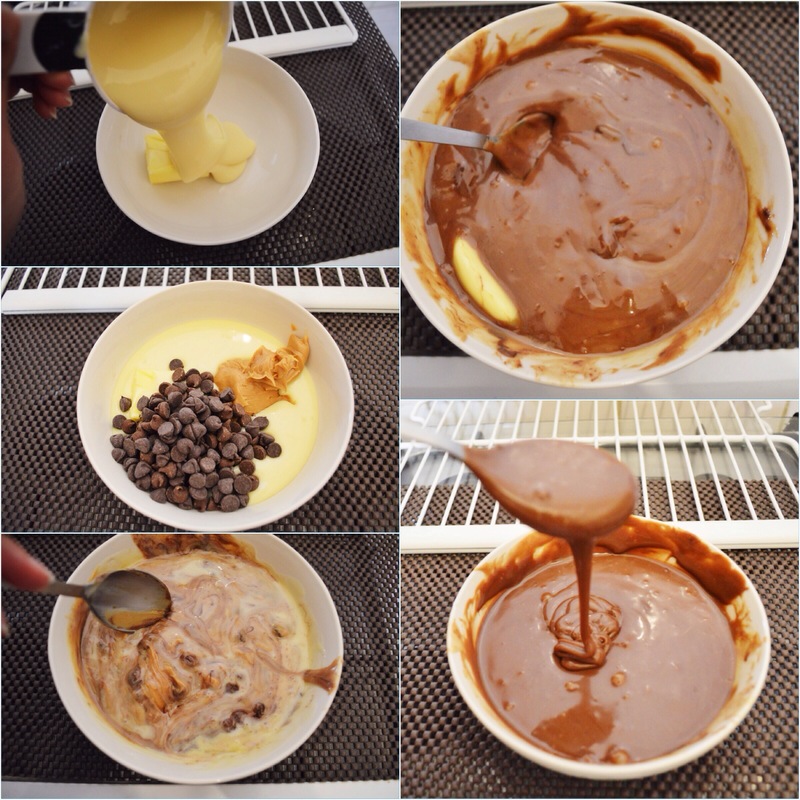 In a microwave safe bowl add the butter, sweetened condensed milk, peanut butter and chocolate chips. Microwave for 30 seconds, stir and microwave another 30 seconds, stir and if needed microwave another 30 seconds. Once everything is melted and combined together stir in the vanilla. Set aside. 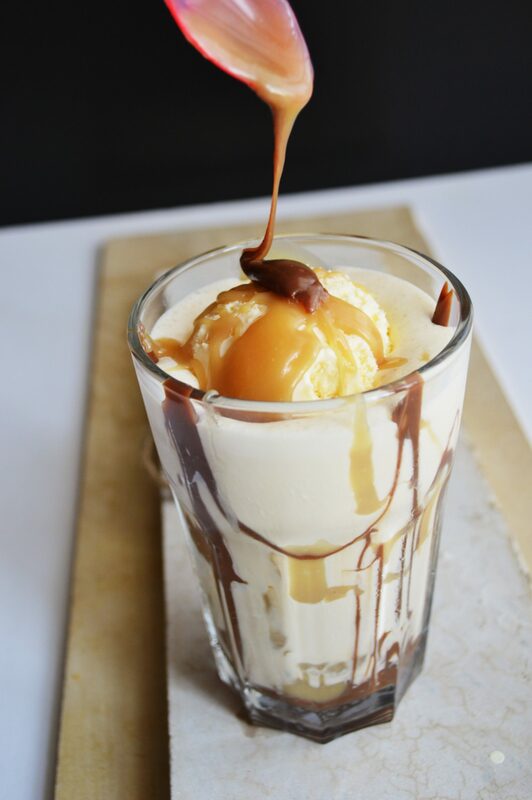 When ready to serve, remove the two glass from the freezer and add the warm hot fudge sauce to the bottom of each glass, then add a drizzle of the butterscotch sauce. Drizzle the chocolate sauce all over the glass very well. Remove the ice cream and the blender jar from the freezer. 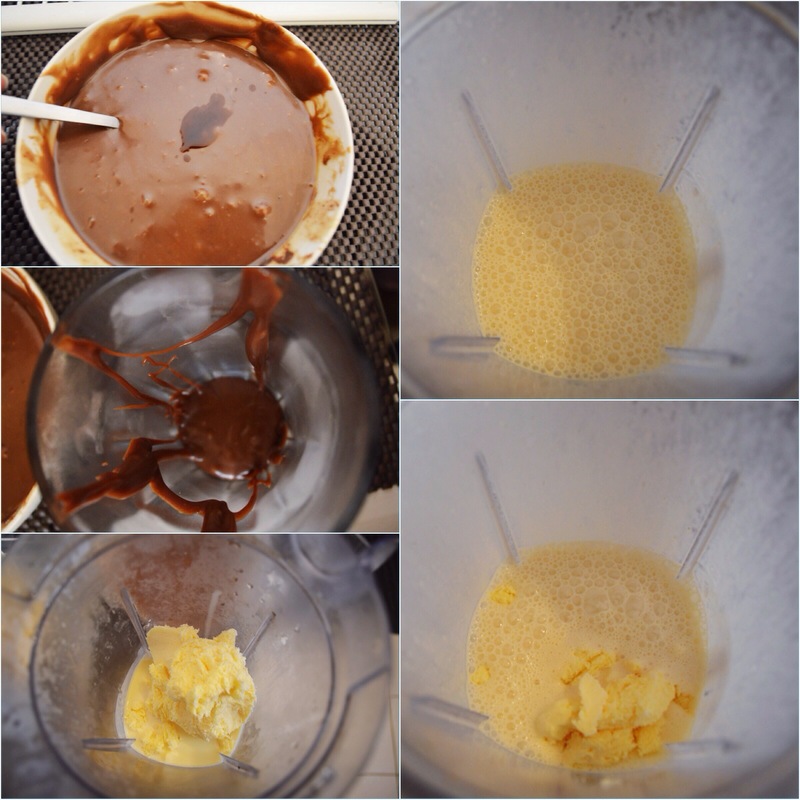 Add the ice cubes and half of the ice cream to the blender and blend on high until smooth. Add the remaining ice cream and blend until chunky or smooth (your call), i just pulsed mine 2-3 times. 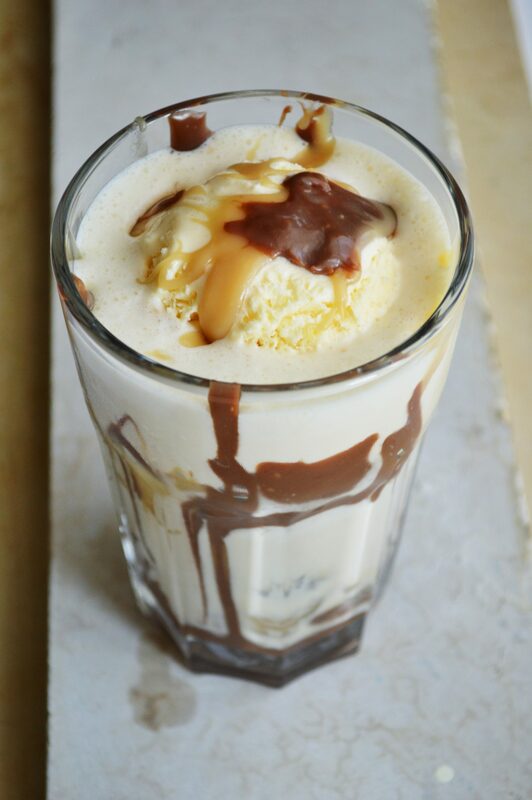 Layer the milkshake in the glasses with the nuts, butterscotch sauce and the peanut butter fudge sauce. Serve immediately. oh i understand you just want to kill now !!!!!! Of course, I could not keep away! So wen r u gonna send me a Kuwait visa?!! OMG, you’re killing me. All my favorites in one glass. I want one NOW!! Wow! Seriously sinful! And I love your dishes and props .. you’re photography is super!